When using vermiculite as an aggregate (e.g. in back filling masses, in plaster), practice has shown that due to the special properties under temperature differences, the resulting tensions are compensated and the development of cracks is reduced to a minimum. Furthermore, adhesion to the base is so good that damages in the overall structure do not occur. 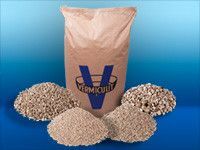 Vermiculite can be ground down to 2 - 3 microns. The typical plate structure is always maintained. The space weight is at 250 - 300 kg/m³. Ground vermiculite can be used as a light, inactive inflammable filler e.g. in soundproofing masses, fire-resistant paints, mortars, lubricants, plywood boards, plastics, to avoid the forming of welding beads outside of the welding area and as a base material for herbicides and insecticides. All details are average values from a larger number of analyses. 100 litre paper sacks, palleted à 24/27 sack or in Big Bags or loose silo loading.